25 player’s have been chosen to compete for a spot on this summer’s Olympic team that will compete in Rio de Janeiro from August 5-21. Finalists for the 2016 U.S. Olympic Team include: Seimone Augustus (Minnesota Lynx), Sue Bird(Seattle Storm), Tamika Catchings (Indiana Fever), Tina Charles (New York Liberty), Elena Delle Donne (Chicago Sky), Skylar Diggins (Dallas Wings), Stefanie Dolson (Washington Mystics), Candice Dupree (Phoenix Mercury), Sylvia Fowles (Minnesota Lynx), Brittney Griner (Phoenix Mercury), Briann January (Indiana Fever), Jantel Lavender (Los Angeles Sparks), Kayla McBride (San Antonio Stars),Angel McCoughtry (Atlanta Dream), Maya Moore (Minnesota Lynx), Chiney Ogwumike (Connecticut Sun), Nnemkadi Ogwumike (Los Angeles Sparks), Candace Parker (Los Angeles Sparks), Danielle Robinson (San Antonio Stars), Odyssey Sims (Dallas Wings), Breanna Stewart (University of Connecticut), Diana Taurasi (Phoenix Mercury), Courtney Vandersloot (Chicago Sky), Lindsay Whalen (Minnesota Lynx), and Jewell Loyd (Seattle Storm). This pool is a mix of veterans, youth and USA basketball experienced players. There are several players on the finalist list that have already secured gold in past Olympic games. 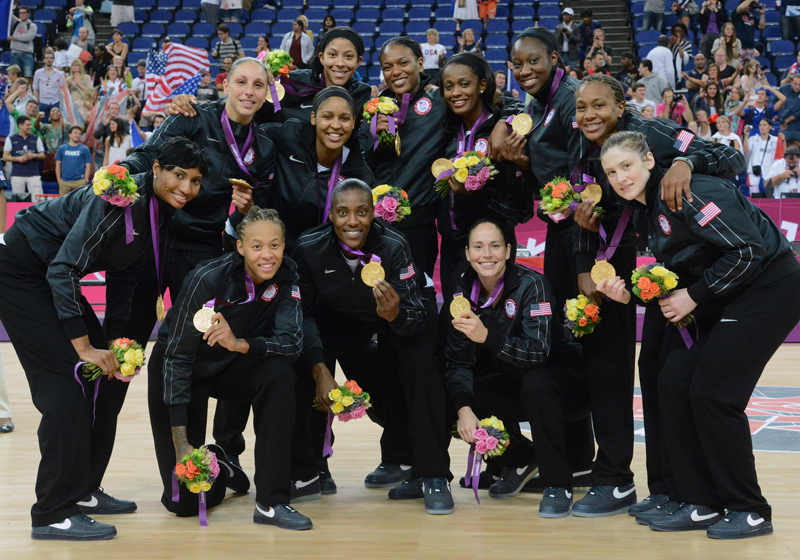 Leading the pack with three gold medals a piece are Bird, Catchings and Taurasi. Augustus, Fowles and Parker have all earned two gold medals, while Charles, McCoughtry, Moore and Whalen have won one. This pool of players is so deep that the U.S. could very well field two teams in Rio. The final roster will include 12 players and will be selected by he USA Basketball Women’s National Team Player Selection Committee. Those include, Reneé Brown, WNBA chief of basketball operations and player relations; Dan Hughes, head coach and general manager of the San Antonio Stars; and Chris Sienko, vice president and general manager of the Connecticut Sun; and three-time Olympic and two-time FIBA World Championship gold medalist Katie Smith, serves as the athlete representative. I’m wondering what new faces may possibly earn a spot on this year’s team. There is some high quality young talent in the pool of 25 who i’m sure are eager to show their talent and compete for one of the 12 spots on the team. The USA Basketball Women’s National Team has won five-straight Olympic gold medals and I don’t see that changing for quite some time. Spain, Australia, Russia and France usually field very competitive squads in the Olympic games and may put up a challenge if they come up against the U.S. Do you see any country giving the U.S. a real challenge? I’m confident in my prediction of the U.S. bringing home Olympic gold medal number 6. This is my top 12.Chosen players.1.Maya Moore. 2. Candace Parker 3. Tina Charles.4. Elena Delle Donne.5. Diana Taurasi. 6Sylvia Fowles. 7. Britney Griner. 8. Angel McCautry..9 .C.Ogwumike. 10. Brianna Stewart.11. Candice Dupree. 12. Sue Bird. Note: on the 25 players chosen, I person cut. Augustus. 12 more to follow. Will be tough for those left out. Perhaps next time. Believe a spot may be taken for Whalen to work with Bird.. May be Dupree..Very tough choice involved.. Whalen may not be totally healed.meh2490. I really though Dewanna Bonner may have made this finalist list honestly after her last few overseas seasons and particularly Mercury last year. Tough though, very much like Opals squad, you look at that and see no Jenna O’Hea, really tough to get yourself in and stay there. Bonner definitely deserved a spot in the 25.
received word that Seimone Agustus was cut from the roster for 2016 chance to play in Rio. Too bad for Augustus at this time. Means that 12 more players will be cut in the next few days or weeks.. Tough job for anyone.meh 2490. N my opinion. These will be the next 12 players to be cut to play in Rio. There will be changes in the event of injury or illness. I only submit this due to the strength and ability of the chosen 12 I have picked. My apologies to those I have chosen on this list,Catchings,Diggins,Dolson,Dupree,January,Lavender.McBride,Robinson,Whalen,Lioyd and N.Ogwumike..meh2490. interesting list. not so sure this will be the lineup but we will see fairly soon. 12. Odyssey Sims or Jewell Lyod. Those are definitely good choices. I really think you cant go wrong with whatever 12 you choose! That’s correct, even with this line up: Mcbride, Robinson, Owgwumike, N.Owgwumike, January, EDD, Griner, Vandersloot, Lavender, Diggins and Sims. Some of them won’t get chance anytime soon and by the time 2020 comes, some of them may have past their prime. You know, I think we should let Bird, Taurasi, and maybe ask Swin Cash to play until they are 50. That’s a real dream team.